I first met Diana Swayne by a series of happy coincidences. At the time, I had no idea that her father was the George Goodchild, one of the most prolific writers of detective fiction in the Golden Age. Happily, this discovery led to a fabulous article penned by Carol Westron in the May edition of Mystery People. If you haven’t had a chance to read it yet, I encourage you to do so. He was a fascinating man. It all started when I began to research material for the fifth book in my Honeychurch Hall Mysteries. 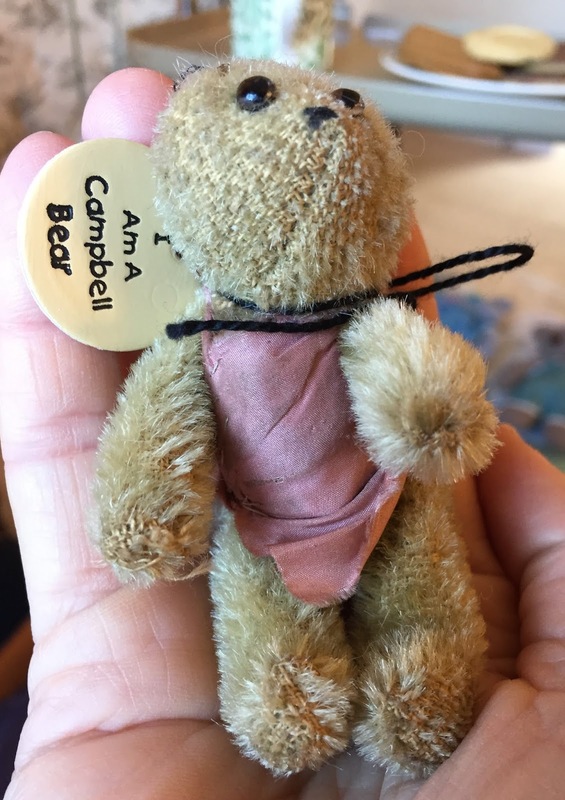 Since my protagonist Kat Stanford is an antique dealer who specializes in bears and dolls, I had been longing to fit a World War 1 mascot bear into my plot and was on a quest to find the real thing. For those unfamiliar with mascot bears, they are sometimes referred to as soldier or pocket bears. During the war years, J K Farnell—one of the first companies to manufacture teddy bears—produced these bears in the thousands. Sold for just a shilling they were given to the men fighting at the Front as a reminder of home. Standing just 3 1/2” high, the bear was the perfect size for an army uniform top pocket. Sadly, like many of their owners, the bears perished in battle but for those that survived, they are a collector’s dream. Edwin, belonging to Second Lieutenant Percy Kinnersley Baddesley, was one such bear. When Percy became one of 420,000 British casualties at the Battle of the Somme, Edwin was sent back to Percy's wife Verna who cherished the bear for the rest of her life. In 2002 Edwin was sold at auction for a staggering £4,230. Thanks to the wonders of the Internet, I contacted Jean Grogan of Little Scruffs in Worcestershire who had been making miniature bears and other stuffed animals for the past fifteen years. Jean told me that she knew of “someone” who had a few! This “someone” turned out to be Diana, an astonishingly vibrant and beautiful 102-year old woman whose enthusiasm and zest for life is, to quote, an Americanism, simply awesome! I couldn’t believe my luck when Diana asked if I’d like to see her bears and dolls, too. I felt as if I was channelling my protagonist. Of course the highlight was meeting the mascot bears. They were just as adorable as I had hoped and definitely took my plot into a new—and deadly—direction. In passing, Diana casually mentioned that her father, George Goodchild, was also a crime fiction writer. I politely asked if I might have heard of him and felt embarrassed that I had not. When I learned just how many books, plays and short stories he had written during his lifetime, I was stunned. As the daughter of such a versatile man, it’s no surprise to learn that Diana had led a fascinating and artistic life, too. Diana attended the Guildford School of Art in 1934 and studied dress design. She told me that she had always enjoyed drawing, painting, craftwork and sewing. 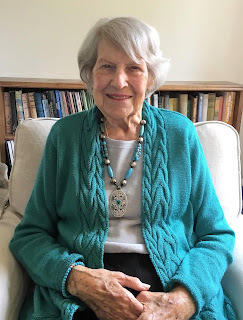 In fact, Diana had taken up watercolour painting at the impressive age of 90 and when I arrived at her house that morning for coffee, she had just finished designing and making an exquisite little felt bear. So I asked her about it. Diana: I don’t know. He was just always there. Hannah: Did your father have a specific routine? Diana: Yes, he always wrote from about 8.30 to 11 and in the afternoon from about 3 to 7. Hannah: Any anecdotes about his writing that come to mind? Diana: I remember him receiving a letter from abroad (I think it was about 1930) addressed to George Goodchild, England!! This caused him some amusement, and me, much pride. It was hardly delayed. Hannah: Did he have any quirky writing habits? Diana: He chain-smoked all the time he was writing. Hannah: Was he always/never available to you emotionally as a child i.e. was he always writing or absorbed in his stories? Diana: As a small child, I used to go and interrupt him while he was working and he was always very patient with me. Later we tried not to bother him. Hannah: What made him turn to writing? Did it start off as a hobby? Diana: As a very young man he worked for a publisher and went on to edit various magazines and publications. He was very ambitious and determined to get on in life. He thought he could write better stories than some of those he saw in popular magazines, and found he had a gift for it. I think it was the Inspector McLean stories (written from 1925 to 1962) that made him famous worldwide. Hannah: How did he research his McLean books? Did he ever visit Scotland Yard? Diana: As far as I know, he never visited Scotland Yard. He had a very old friend who was Chief Constable for the County and probably asked him a question or two occasionally. Hannah: Did he draw storylines from his own life, from observing others, from headlines in the news or purely from his own imagination? Diana: Mostly from imagination, but he was very observant and interested in people, and he had many friends with different lifestyles. Hannah: Which of your father’s characters or stories are among your favourites? Diana: I think ‘Companion to Sirius’ is one of his best. The Cornish background is delightful, the characters are interesting and unusual, and the mystery most intriguing. I love it. Hannah: What kind of reaction do you think he would have towards today’s most popular detective writers? Diana: I don’t know since I never read them myself. Hannah: Who are your favourite writers? Diana: So many and so diverse! Daphne du Maurier, Somerset Maugham, A.A. Milne, Rosamund Pilcher, Robert Louis Stephenson, Captain Frederick Marryat, H.G. Wells, Emily Bronte, Dornford Yates, Jane Austen, Shakespeare, Samuel Pepys, Matthew Arnold, Jules Verne, to name a few. Hannah: As you have aged, has your perspective of him changed? Hannah: What is the greatest gift or piece of advice that your father has given you? Diana: A love of writing, which can be enjoyed in old age when one’s eyesight and hearing are failing. Hannah Dennison is the author of The Vicky Hill Mysteries (Constable Crime) and the Honeychurch Hall Mysteries (Minotaur), both set in the wilds of the Devonshire countryside. British born, Hannah originally moved to Los Angeles to pursue screenwriting. She has been an obituary reporter, antique dealer, private jet flight attendant and Hollywood story analyst. She continues to teach mystery writing workshops at the UCLA Extension Writers’ Program in Los Angeles, California. She has served on numerous judging committees for Mystery Writers of America and is serving on the MWA board for 2016-2018. Currently living in Portland, Oregon, Hannah will be relocating to Devon with her two crazy Vizsla dogs this coming summer—an exciting, albeit daunting move after twenty-five years of living in the USA.